One of the South's premier cities, Atlanta is home to an abundance of spectacular hiking and walking destinations. From urban hikes to suburban parks and rural wilderness, 60 Hikes within 60 Miles: Atlanta shows readers how to quickly drive to and enjoy the best area hikes. The Chattahoochee River National Recreation Area offers a wide range of outdoor activity, including several scenic hikes. Hik… es from the Georgia mountains, Stone Mountain Park, Kennesaw Mountain National Battlefield Park, Sprewell Bluff, and locations in between provide Atlantans a diverse combination of hikes in length and difficulty.In addition to scenic charm, many hikes have great historical appeal, such as Burnt Hickory Loop and Cheatham Hill Trail. Other trails, such as Grant Park Loop and the Atlanta Ramble, feature major Atlanta attractions. 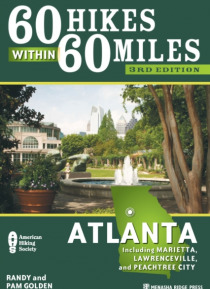 Complete with directions, maps, and a wealth of historical detail, the guide beckons hikers of all ages and fitness levels into the out of doors.With this newly revised and updated 3rd edition, hikers will have no trouble selecting the perfect hike for spending an hour or an afternoon out on the beautiful trails of Atlanta.